A study by a researcher in the Syracuse University College of Arts and Sciences offers new clues to what may have triggered the world's most catastrophic extinction, nearly 252 million years ago. James Muirhead, a research associate in the Department of Earth Sciences, is the co-author of an article in Nature Communications (Macmillan Publishers Limited, 2017) titled "Initial Pulse of Siberian Traps Sills as the Trigger of the End-Permian Mass Extinction." His research involves Seth Burgess, the article's lead author and a geologist at the U.S. Geological Survey, and Samuel Bowring, the Robert R. Shock Professor of Geology at the Massachusetts Institute of Technology. 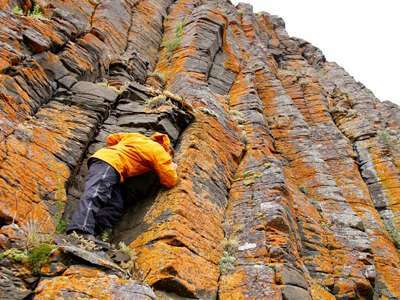 Their findings suggest that the formation of intrusive igneous rock, known as sills, sparked a chain of events that brought the Permian geological period to a close. In the process, more than 95 percent of marine species and 70 percent of land species vanished. "There have been five major mass extinctions, since life originated on Earth more than 600 million years ago," says Burgess, who works at the nexus of volcanic and tectonic processes. "Most of these events have been blamed, at various times, on volcanic eruptions and asteroids impacts. By reexamining the timing and connection between magmatism [the movement of magma], climate change and extinction, we've created a model that explains what triggered the end-Permian mass extinction." Central to their study is a large igneous province (LIP) in Russia called the Siberian Traps. Spanning more than 500,000 square miles, this rocky outpost was the site of nearly a million years of epic volcanic activity. Broad, flat volcanoes likely dispelled significant volumes of lava, ashes and gas, while pushing sulfur dioxide, carbon dioxide and methane to dangerous levels in the environment. "Until recently, the relative timing and duration of mass extinctions and LIP volcanism was obscured by age imprecision," Muirhead says. "Our model is based on new, high-resolution age data that suggests surface lava flows erupted too early to drive mass extinction. Instead, there was a subinterval of magmatism—a shorter, particular part of the LIP—that triggered a cascade of events causing mass extinction." The trigger? Extreme heat given off during the formation of sills. "Heat from sills exposed untapped, gas-rich sediments to contact metamorphism [the process in which rock minerals and texture are changed by exposure to heat and pressure], thus liberating the massive greenhouse gas volumes needed to drive extinction," Muirhead says. "Our model links the onset of extinction with the initial pulse of sill emplacement. It represents a critical juncture in the evolution of life on Earth." There are two ways that magma forms igneous rock. One way is extrusion, in which magma erupts through volcanic craters and cracks in the Earth's surface; the other is intrusion, whereby magma forces itself between or through existing formations of rock, without reaching the surface. Common types of intrusion are sills, dykes and batholiths. 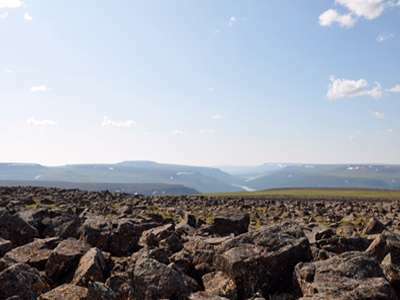 Sills in Siberia's Tunguska Basin, where Muirhead's team carries out most of its research, likely pushed their way through limestone, coal, clastic rocks and evaporates. The mixture of hot, molten rock and hydrocarbon-bearing coals is thought to have set the stage for massive greenhouse gas release and global-scale climate change. "Sediment composition and the amount of hydrocarbons [petroleum and natural gas] available within these sediments help us understand whether or not an LIP can trigger a mass extinction," says Burgess, adding that his team's model may apply to other extinction events coinciding with LIPs. "Mass extinction can take 10,000 years or less—the blink of an eye, by geological standards—but its effects on the evolutionary trajectory of life are still observable today." Wilkesland impact crater and Falkland Island impact crater had nothing what-so-ever to do with the formation of the Siberian Traps. Quite a bit more than 6 x 10^8 years ago. Worthy of note that here we have the biggest mass extinction ever and it's now looking like it was due to CO₂ induced climate change. Just sayin'. @Da Schneib, they just said 'life' they did not say multicellular life.